I was deep in the Golden Trout Wilderness camping along the South Fork Kern River as a means to reach Overlook Mtn, a 10Kft/P900 even deeper in the Wilderness. Rather than making a horrendous dayhike of some 40mi of it, I was combining it with Templeton Mtn in a 3-night backpacking trip. I had started the previous morning from Horseshoe Meadow and spent the night along the creek roughly halfway between Tunnel and Ramshaw Meadows. The morning sun was blocked by forested slopes to the east and it wasn't until almost 7:30a that I ventured out of the sack, packed up my gear and ate breakfast. Planning to spend a second night here, I left my backpack against a large tree and the food I wasn't carrying hanging from one of its branches. With just a hip pack and a few quarts of water I set out for the elusive Overlook Mtn. My approach direction did not have much to offer in the way of making Overlook appear impressive. It rises some 4,000ft to the east above the main fork of the Kern River, but from the direction I approached it's all gently rising forested slopes, the summit not even visible from anywhere along the trail I plied. I hiked back up to the trail junctions near Tunnel Station and headed west, dropping to Golden Trout Creek and crossing it twice before climbing to a saddle separating it from Volcano Meadow. The second crossing, about 3/4mi west of the trivial first crossing was more difficult thanks to beaver dams that had made a swampy mess out of this portion of the creek. I had to wade through tall grass, lose the trail and give at least one foot a dunking before recovering. At the trail's highpoint before it descends to Volcano Meadow I paused to pay a visit to the top of Groundhog Cinder Cone. This is the youngest of a handful of small volcanos that began erupting as far back as 3/4 million years with the most recent lava flow occurring only 5-10,000 yrs ago. 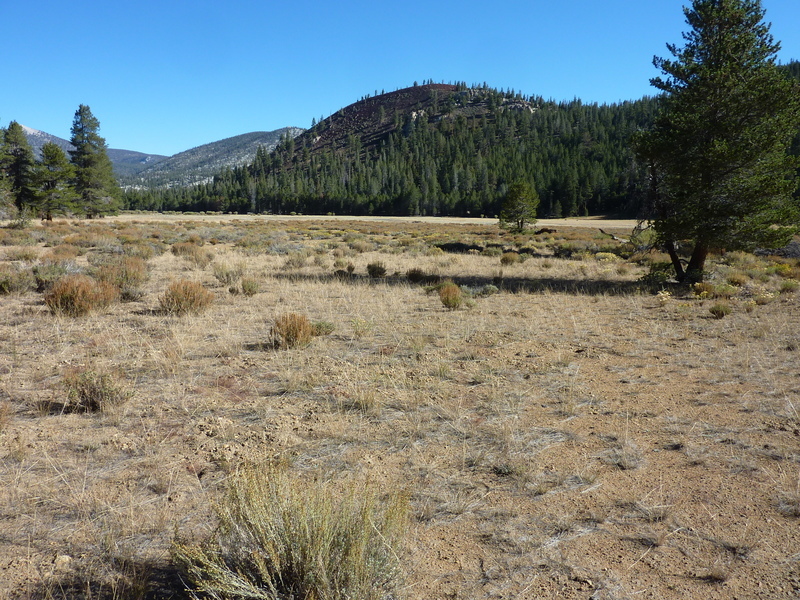 As with much of the wider area comprising the east half of the Golden Trout Wilderness, there is much poorly consolidated granite and consequently much annoying sand for miles of trail. The volcanic activity has added fields of much lighter red and brown volcanic rock that is pulverized into dust on the trail, discoloring boots and throwing up a mild breathing hazard - take your pick which is worse. All of this isn't to say that Groundhog Cinder Cone has no redeeming qualities. To the contrary, it was the only place on my way to Overlook Mtn from which I could actually see Overlook Mtn. And other parts of the Wilderness as well, including Johnson to the north (which we climbed on the last day of the Sierra Challenge this year) and of course Kern Peak which seems to be visible from almost everywhere in the Golden Trout Wilderness. I returned to the saddle and continued on to Volcano Meadow. It was all brown with little forage remaining, like most of the meadows at this time of year. Because I had forgone the use of the built-for-stock switchbacks and simply headed cross-country on my way down, I lost track of the trail by the time I emerged from the trees. Luckily there is little marsh/swamp to contend with across the meadow when it's this dry and I simply walked across the center, careful at the few locations that still dribbled water. On the opposite side of the meadow I launched back into the forest looking for the trail heading up Right Stringer, a fork of Golden Trout Creek. The 7.5' maps shows this continuing to Right Stringer Pass and then down the opposite side before "disappearing" on the adjacent quad as it drops to the Kern River. Because it it bore the label "location approximate" I suspected the trail might not exist at all. The trail up Right Stringer does exist, I found, as evidenced by the familiar blazes one finds on trees, but it hasn't been maintained in decades. From an historical perspective it was interesting to try and follow this faintest of treads through the forest understory, over downfall, occasionally moving to one side of the dry creek or the other, but it offered little tactical advantage in negotiating the terrain. In fact I found myself moving pretty much at the same speed whether I could identify the trail or not. With this in mind, I was about halfway up to the pass when it occurred to me that I could shorten my route some by avoiding the sharp right turn I would need to take from the pass. So I moved right, out of the drainage and gained the ridgeline separating Right Stringer from Malpais Creek. This led nicely up through more forest (so many trees that I didn't take a photo for an hour and a half), eventually getting me to the open views atop Overlook Mountain. The name Overlook undoubtedly was chosen for its fine vantage from which to view the Kern River drainage as it cuts a north-south gorge through the center of the range starting in the high country of SEKI NP, through the Golden Trout Wilderness and far south to Lake Isabella. At first it looked like unfamiliar territory, but eventually I picked out a few familiar points including Kaweah Ridge to the north and the Needles to the south and started stitching other points in their place - Coyote and Angora Peaks across the river on the Great Western Divide, Hockett Peak to the south, Whitney and Langley to the northeast. My original plan had been to climb Overlook, return to Right Stringer Pass and then climb Three Rocks on the other side, but that seemed like so much work from where I sat that I quickly lost interest. An alternate plan I had looked at ahead of time was to visit nearby Tower Rock on the edge of the Kern gorge which now looked more inviting. I had thought the terrain might be too rough and involve some awful bushwhacking, but it looked pretty good from what I could see of it and if I did things right in returning I could minimize the amount of elevation gain - certainly a lot less than Three Rocks would involve. And so I set off north from the summit after I'd been there 15-20min and had my fill. Getting from Overlook to Tower Rock proved to be no big deal. Some rock outcrops just north of Overlook had me almost dropping off the ridge too early (I would have paid for that with much sidehilling lower down), but I found the line I was looking for which curved down to a shallow saddle between the two. The going was through open forest with some moderate amounts of manzanita that never presented heavy bushwhacking. Downhill travel made it all much easier. The saddle proved to be a long spit of easy, sandy travel with a last climb of maybe a hundred feet of class 2 to reach the broad summit area, taking in all about an hour and quarter to get between Overlook and Tower Rock. I wandered around the three or four points vying for highpoint status, never really determining which was higher or finding any sort of register. The views of the Kern River drainage are nothing short of amazing. The river cuts a deep canyon in a nearly straight line for almost 20mi looking north into the High Country of SEKI NP, running by the base of Tower Rock some 2,000ft below and continuing far to the south. A SEKI backcountry ranger station is located in one of the riverside meadows, one of the most remote locations in the range at the edge of the national park. The footbridge for the trail climbing to Volcano Meadow was clearly visible. It was down there near the ranger station that the 1905 Sierra Club Trip set up base camp, eventually totaling over 200 persons. Most were there for the chance to climb Mt. Whitney, first climbed only 30yrs earlier. The scribes of that trip compared Tower Rock to Yosemite's and Kings Canyon's Sentinel Rock. Judging by the precipitous drop I was cautiously looking down, it must certainly be an impressive sight from below. Looking up, Overlook Mtn (which I believe was referred to as Kern Dome in the 1905 Sierra Club Bulletin write-up) presents a much more impressive profile than it had coming in from the east. After leaving the summit and returning to the saddle, I contoured northeast across moderate slopes for much of a mile in search of the trail rising up from the Kern River below. I ended up dropping only about 400ft before finding the trail pretty much where the GPSr showed it to be. I had many miles to return still, but the rest of the day would be on trail. Not far above from where I intersected the trail I came across a feature identified on the topo map as a natural bridge. Lava from Groundhog Cinder Cone had spilled down the Golden Trout Creek drainage some 5-6mi. The bridge through which the creek flows was probably a lava tube at one time, now mostly collapsed and eroded through eons of time. There are actually two bridges within about 50yds of each other. The trail actually crosses over the larger of the two which makes it quite remarkable. I photographed it from several angles before continuing up the trail. Much of the route up from the Kern River along the Golden Trout Creek was part of the old Hockett Trail, a supply route in the late 1800's (and so existed as an approach route to Mt. Whitney as used by the 1905 Sierra Club party). I followed this gently rising trail for more than an hour before stopping to take a dip in the creek around 2:30p. The waters were chilly but refreshing and it did much to revive my flagging spirits. I followed the trail to Little Whitney Meadow where one can still find stock fencing in poor but still serviceable condition. No cows or horses or people for that matter were seen today. I followed the trail east from Little Whitney for another hour, rising another 500ft to the vicinity of Tunnel Station. Here I climbed out of the Golden Trout drainage and back down to the South Fork Kern River drainage where I was camped, returning shortly after 4p. While I had been plying the trail for the past several hours it occurred to me that I might save a day and still get to Templeton Mtn if I moved camp this afternoon. It wasn't so much the day I was wanting to save as much as another night - sleeping on the ground just isn't all that comfortable to me. So with this in mind, I collected my food hanging from the tree, reshouldered my backpack, and head off down the trail towards Templeton.